Look: it’s a copy of the paperback third edition of The Elements of Style, front and nearly center. I swear, even at a distance that book is as instantly recognizable as, say, T.S. Eliot’s Complete Poems and Plays, or a pack of Luckies. 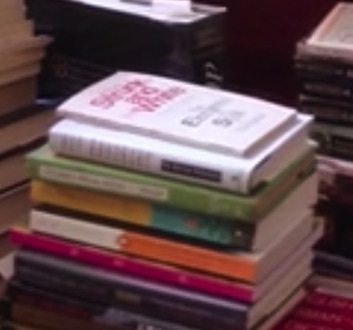 This fleeting image is from the brief introduction to the Netflix series Tidying Up with Marie Kondo. Kondo is tapping the books to wake them up. No, really. I haven’t seen the episode with these books yet, but I will already guess that many of them did not survive long past the exterminating angel’s wakeup call. Elaine and I have watched just two episodes of this series, which I would describe as Amélie meets Hoarders. In truth, the problems with stuff in the episodes we’ve seen are milder than the problems of hoarders. But the problems are still severe enough to make me think that our household is pretty well organized by comparison. (Phew.) Then again, we have been folding for some time now, under the Kondo spell. Amélie meets Hoarders! Made my day. I'm pretty sure that was the edition I studied at school with. 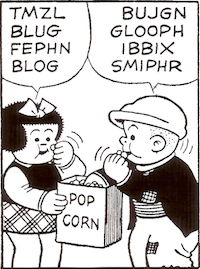 Is the smaller, darker typeface a blue, if I remember? It may be a funny statement following on the heels of that question, but I also have a strong impression in my memory of that edition and its cover. @Berit: It’s red and black type. The changing covers are worth looking at. I like the 1959 hardcover jacket (so mid-century modern) and the third edition (the red and black) the best. The pink and blue cover makes me think of calamine lotion. Fresca, I saw your comment after making my own. I would say yes, but maybe not in the way you’re asking. I think the real value of The Elements of Style is that it can serve as inspiration. In other words, here’s a little book, not intimidating in the manner of a “handbook” (the nearly thousand-page-long book used in many college comp classes), that lets you believe you can become a better writer. I think Marie Kondo’s book works in a similar way with getting organized. I bet you see many copies of Strunk and White, eh? Huh, you know, surprisingly, not a single copy of Strunk & White has been donated to the thrift store since I started 7 months ago! I was surprised how much I liked Marie Kondo's book (Life Changing Magic of Tidying Up), when a friend practically forced me to read it. If you don't want or need it, why do you have it in your life? But I was disappointed in the one episode of Kondo's Netflix show I watched. Not very good storytelling. Or maybe I just watched a particularly uninteresting family. I think I really just wanted to watch Kondo enthuse more along the lines of, "I LOVE mess!" Love your Amelie comparison: Yes! 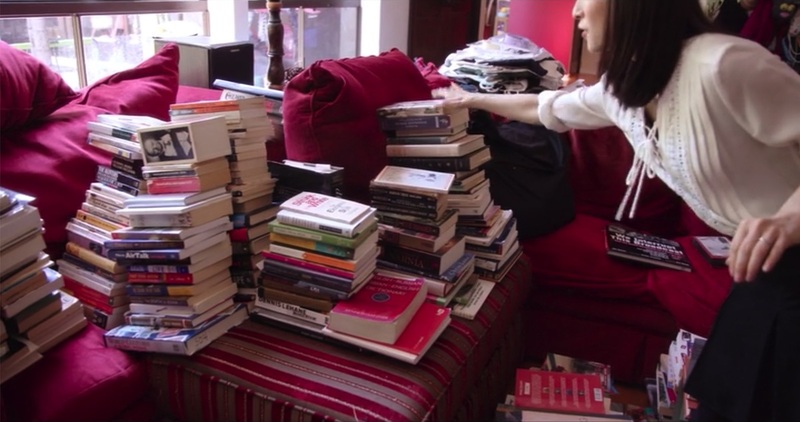 The thing I really appreciate from Marie Kondo: I don’t miss anything I’ve gotten rid of. I plan on watching more, but it is a pretty lackluster show. It needs more of Marie Kondo being Marie Kondo, and fewer shots of people answering the door and being amazed to see her.